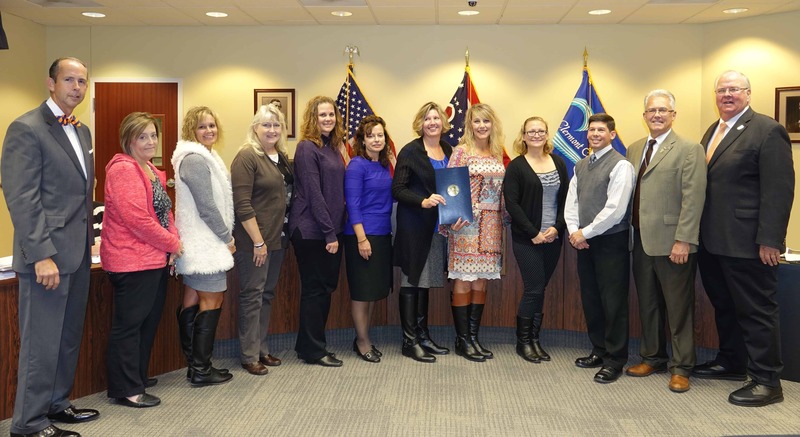 Children’s Protective Services staff and Commissioners, who proclaimed November 2017 National Adoption Month. BATAVIA, Ohio – Teens Need Families, No Matter What. That’s the theme of 2017’s National Adoption Awareness Month, which is recognized nationally and in Clermont County in November every year. And finding homes for older children, particularly teens, can be difficult, said Julie Jordan, Adoption Supervisor at Children’s Protective Services. According to the most recent report from the Children’s Bureau, which advocates for the welfare of children and families, more than 110,000 children and youth in foster care are waiting to be adopted across the United States, and close to 12,500 of them are between the ages of 15 and 17 years old. Currently, Clermont County has 19 children awaiting adoption. These are children who were removed from their parents’ home due to abuse and/or neglect. Most of these children then entered foster care. After parental rights were terminated – typically after two years, when parents fail to take the steps necessary for reunification – the children can be adopted. In Clermont County, these teens include Clarissa, who is 16, and Kennedy, 17; Caleb who is 14, and Jayden, who is 13. Brief biographies can be found on each child at http://www.clermontforkids.org/waiting-children/. The opioid crisis in Clermont County has contributed to the cases of abuse and neglect that compel CPS to remove children from their parents’ home, Jordan said. And that’s also a reason why there are more tweens and teens waiting for a family. One pathway to adopting older children is to become a foster parent first. The adoption team at Children’s Protective Services promotes foster-to-adopt certification as the best way to offer children a stable and nurturing home. Dan and Viola Rice of Mount Orab, who have adopted five children through CPS’s foster-to-adopt, and have fostered more than 40 children, are strong advocates of this method. In 2017, 38 children have been adopted by 23 families to date. To find out more about foster care or adoption through Clermont County Children’s Protective Services, please call 513.732.7765. The website www.clermontforkids.org has information on the foster-to- adopt process, and also has a list of children currently waiting for a forever family.